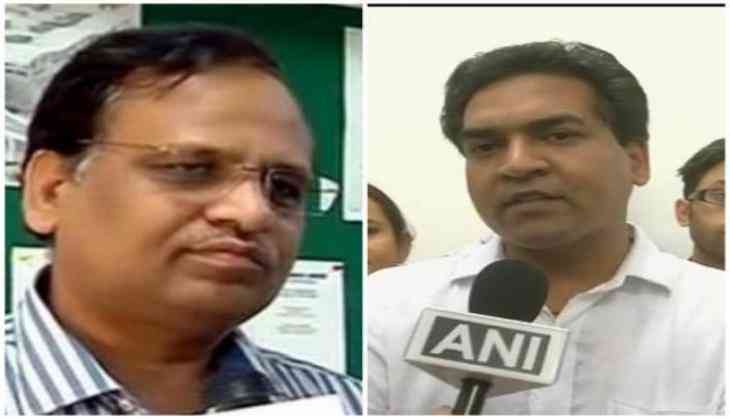 The infectious infighting within the Aam Aadmi Party (AAP) shows no sign of slowing down as Health Minister Satyendar Jain on Friday filed a criminal defamation case sacked minister Kapil Mishra. Jain has also filed a suit against Bharatiya Janata Party (BJP)-Shiromani Akali Dal (SAD) MLA Manjinder S. Sirsa in the Tis Hazari Court here. Earlier on Wednesday, Mishra took the fight against Kejriwal to the Central Board of Direct Taxes (CBDT) and filed a complaint against the former for financial irregularities. Mishra claimed that the Income Tax authorities have started probing the allegations raised by him against fake companies registered in the name of AAP MLA Shivcharan Goyal. Mishra told media, "The income tax department has started investigations against the fake companies registered in the name of AAP MLA Shivcharan Goyal." Mishra had approached the Central Bureau of Investigation (CBI) to submit evidences of corruption against Arvind Kejriwal. Mishra has also alleged that for three continuous years, black money was converted into white and spent on foreign trips of AAP leaders. "AAP did not inform about some of its funding which it received from fake companies," he said. Mishra targeted Kejriwal and revealed that 16 shell companies deposited money worth crores in the AAP's bank accounts. "These fake companies are registered in the name of AAP MLA from Moti Nagar, Shivcharan Goyal. These companies have given Rs. two crore to Kejriwal. The funds received from these companies were sent to same branch of Axis Bank where there were allegations of converting black money into white at the time of demonetisation," he added.